London Welsh have reached an agreement with Premiership Rugby (PRL) over a settlement on current funding issues. The relegated club argued the odds of top-flight survival are stacked against newly-promoted sides. "We're delighted we have now reached a settlement which addresses certain aspects of our central funding," said Welsh chairman Bleddyn Phillips. 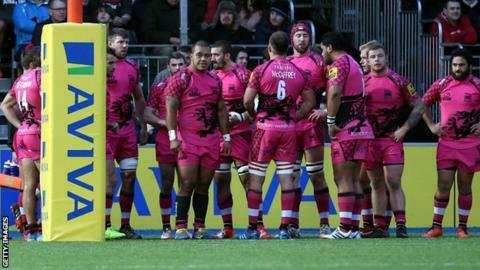 Exiles director Stephen Cole had claimed there was a £2m gap for clubs like London Welsh to try to compete against, but their appeal has now been heard after reaching agreement with the PRL and its shareholder clubs. "We are grateful to PRL, the RFU and their Executive for the support in achieving this. We believe this agreement is in the best interests of London Welsh, the PRL shareholders and the RFU," Phillips added. P shares, worth 25% of income, are only given to 13 clubs. "On behalf of the club, I would also like to thank and pay tribute to all our supporters, sponsors and stakeholders for their patience and understanding in bearing with the club in recent months as we have conducted the negotiations." Prior to the agreement, the Premiership worked on a shareholding system with teams receiving so-called "B shares" on their promotion to the top flight, followed by five "A shares" for every year they stay there - up to a maximum of 40. However, for each season a side is out of the Premiership, they lose five "A shares". There are also 13 "P shares", which are worth 25% of a club's central funding income. In 2013, Exeter Chiefs - who were promoted in 2010 and have since established themselves in the Premiership - bought Leeds' "P shares" for £5m. The club also called for an end to the Championship play-off system, saying it does not give newly-promoted sides enough time to sign players good enough to compete in the Premiership. This season, the play-offs have been brought forward slightly so the club gaining promotion to the Premiership will know their fate on Wednesday, 27 May. Welsh were also unhappy about the arrangements in place for academies, with the Exiles having to contribute towards the overall cost of Premiership clubs running academies without being allowed to develop their own. The academy system works on a geographical basis, with Oxfordshire currently allocated to Wasps - who have relocated to Coventry.